Firstly, men today are more comfortable with experimenting with their own style and pushing boundaries when it comes to fashion. We as male consumers are so much more in-tune, with how we style ourselves from how it was 10 years back. It's not unusual now for guys to want to take extra time to present themselves better. Men's wardrobes are becoming fun places to visit and are often now busy with potential outfits. But it doesn't stop in the bedroom, because men's grooming, beauty and now cosmetics are taking over bathrooms in great volume. Accessories for men have become huge thing too over the last few years. Watches, jewelry and pieces such as pocket squares, help just give a look a little extra something. Pocket squares are guaranteed to draw some attention, especially if they are styled alongside the suit you're wearing. It will give a complete look something more and you'll project yourself polished and professional. It shows also your attention to small details too, which in turn for a job interview can be read about your character, even before you get the job. Be adventurous and start a collection. Secondly, pocket squares are limitless in design and styles. You can put together a simple tailored suit outfit, coloured in stone. If you're after something to give a punch of colour then a pocket square can be used to exactly that. It will really stand out from a block coloured suit choice. The choice available for men, allow every type of personal style to be accounted for. Whether it is shapes, patterns and lines, colours etc. You'll find something for any style. Finally, Rolex's are super expensive and what average male consumer, can really buy one? Lets be real. For a huge percentage of the cost of a branded watch, you can get yourself a pocket square which is just as smart. Being sensible with your accessories lets everyone know, you're on the ball and organised. Your outfit details will always looked planned and articulated well. You shouldn't ever feel the need to break the bank when accessorising. It literally just takes time to find great accessory pieces, to help finalise your outfit. Build on it and have yourself some variety and options. Least this way your days at the office give you different stylized looks and keeps everything fresh. The idea of wearing the same expensive watch each day, just sounds a bit boring. 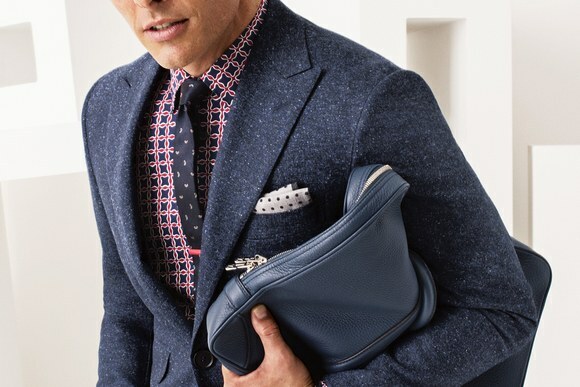 Would you rather be that guy, or the guy who's pocket squares spark great conversations? It really doesn't take much to bring a look together and like we've mentioned above it doesn't cost much too. Working in a major city can get repetitive, but your stylized looks do not need to be too. You'll keep your colleagues on their toes, on which pocket square design you'll be wearing the next time you're in the office. MPS is a great place to start if you're new to pocket squares. They have recently starting working with 'Fox & Luther' to help bring some artistic flair to their male audience. What better place to visit to get your weekly style inspiration fix?